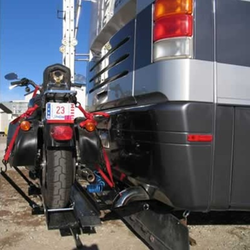 Its the fastest and easiest way to mount a motorcycle on your motorhome or bus. An adjustable width tire stop makes it easy to change configurations for different sized motorcycles. Ramp size narrows from 7 7/8" to 6". **Do not exceed the weight rating of your vehicle's hitch.